​Ahead of the first ever European Heart Valve Disease Awareness Day the European partner organisations involved will be presenting their European Heart Valve Disease Partnership Manifesto outlining the the core calls to action of the initiative. The European Heart Valve Disease Partnership Manifesto has been put together by Aliiance du Coeur, AEPOVAC, Hart Volgars, Cuore Italia, Croi and Heart Valve Voice UK, patient organisations from across Europe committed to helping to spread the word about the need for the timely diagnosis and treatment for heart valve disease. The manifesto brings together new evidence and data on heart valve disease services across Europe, which demonstrates the need for change. It also sets out recommendations that are crucial to the improvement of the diagnosis, treatment and care for patients with heart valve disease. Access - for equal access for all to heart valve disease therapies which provide the best and most rapid return to a good quality of life. 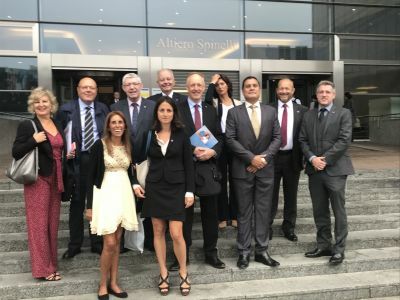 Representatives from each of the organisations along with Member of European Parliament (MEP), Mairead McGuinness, met in Brussels today to present the manifesto to fellow MEPs, clinicians, industry representative and patients. They discussed the issues surrounding heart valve disease across Europe and heard from patient Pat Khan about her experiences as a patient and a patient ambassador. The day proved to be a big step forward in the campaign to raise awareness of heart valve disease in Europe as the MEPs and guests in attendance all expressed an interest in getting more involved in helping to elevate the profile of valve disease and make more people aware of the symptoms, the importance of asking for stethoscope examinations and need for early diagnosis and timely treatment.